"Measuring with precision human activity on the climate is something very challenging to do, and there’s tremendous disagreement about the degree of impact," Pruitt said on CNBC’s "Squawk Box" on Thursday. "So no, I would not agree it’s a primary contributor to the global warming that we see." In an interview with Bloomberg News, Pruitt said the Trump administration wouldn’t defend the EPA’s Clean Power Plan in court and stressed that carbon dioxide emissions have fallen to the lowest level in decades without any government intervention. He credited innovations in the oil and gas sector for the decline. "I believe it’s because of horizontal drilling and hydraulic fracturing," he said, which has led to greater use of natural gas. And he criticized environmentalists who want to curb carbon emissions but do not support nuclear power. Pruitt, who was sworn in last month to lead the EPA, said during his confirmation hearing that humans were responsible for global warming, but also stressed he wasn’t sure how much. His comments Thursday, delivered ahead of an address to the CERAWeek energy conference in Houston, went further to discount the role of people. They also buck the conclusions of climate scientists, who have attributed a string of record hot temperatures to heat-trapping greenhouse gases. Last year was the hottest on record, the third consecutive record year, according to the National Oceanic and Atmospheric Administration. Critics say debating the cause is a way to avoid taking action to curb the use of fossil fuels. Pruitt said more debate and analysis is needed on the issue, and said he agreed with the assessment that the Obama administration directed too much energy towards addressing climate change and not enough toward environmental concerns such as water treatment or toxic-waste cleanup. His comments drew a swift retort from critics in Congress. "His views are in direct opposition to what the overwhelming majority of scientists believe in this case and that really is sad," Senator Bernie Sanders, a Vermont independent and a candidate for the Democratic presidential nomination last year, said in an interview. In his prior role as Oklahoma attorney general, Pruitt joined a lawsuit challenging the EPA’s conclusion under Obama that greenhouse gas emissions posed a risk to human health and welfare. "It’s why we should have never confirmed him. It’s why he is unqualified to do that job," said Senator Brian Schatz, a Hawaii Democrat who has been active on climate change and vigorously opposed Pruitt’s nomination. "He held it together for one hearing, but he is a climate denier. There is no doubt about it." Pruitt reiterated plans to roll back a suite of Obama-era environmental rules, including the Clean Power Plan that forces states to slash greenhouse gas emissions from generating electricity. President Donald Trump would soon direct efforts to repeal both the power-sector regulation and one governing potent methane emissions from oil and gas wells, as he had done with an Obama-era clean water rule, Pruitt said. The agency should not use resources "in ways that don’t provide certainty and clarity to those in the marketplace," Pruitt said in the interview, calling the Clean Power Plan a prime example. Pruitt has promised to focus the EPA on some of its core environmental work, including cleaning up sites contaminated with toxic chemicals. The Obama administration’s focus on climate change meant "some of those other priorities were left behind," Pruitt told a conference of conservative activists Feb. 26. "We’re encouraged to hear the new head of the EPA start the important conversation about the true costs of carbon taxes and regulations on the economy," Chrissy Harbin, Americans for Prosperity’s vice president of external affairs, said in an email. "Small businesses and working families deserve an open and candid discussion about the real-life impacts of the energy policies promoted by the Obama Administration." The White House is said to have proposed a 25 percent budget cut for the EPA. Pruitt has resisted that proposal, saying he will fight to protect funding for federal grants to states and programs to clean up contaminated sites across the country. But Pruitt said Thursday that he supports reducing the number of regional EPA offices from 10 to eight. Moving forward, water infrastructure will be a priority for the agency, Pruitt said. The president has asked Pruitt to serve on a water working group, providing recommendations on a $1 trillion infrastructure package. 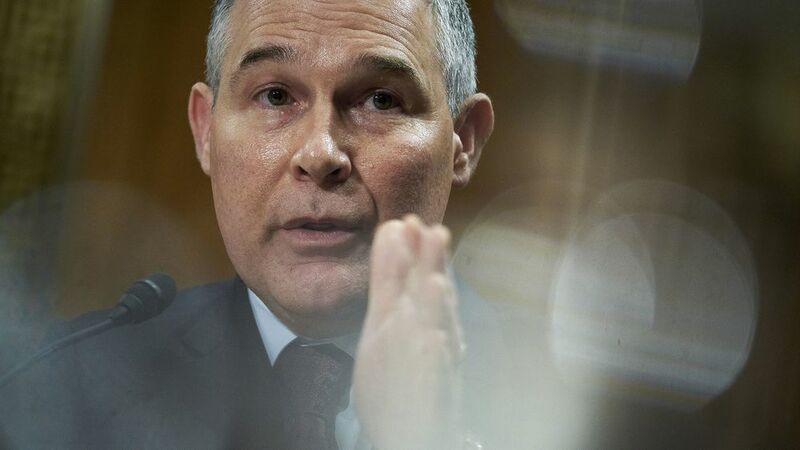 In his CNBC interview Thursday, Pruitt also criticized the "process" behind the EPA’s January decision to uphold rules to slash vehicle greenhouse gas emissions through 2025, a controversial move automakers say was rushed through by the Obama administration. He said the agency will take action on the vehicle standards "very soon" without offering specifics. People familiar with the situation have said the agency is planning to reopen the midterm evaluation of the emissions rules, which aim to boost fuel economy to more than 50 miles per gallon by 2025 from around 36 today. Liz Purchia, who served as an acting associate administrator in the agency during the Obama administration, called Pruitt’s remarks "an embarrassment." "He apparently hasn’t listened to the scientists who work for him at EPA," she said in an email.